The 50-member-committee appointed by interim President Adly Mansour is tasked with amending Egypt’s constitution. Egypt’s new draft constitution was approved Sunday for a referendum billed as the first stage in a “democratic transition” promised by military-installed authorities after Islamist president Mohammed Mursi’s July ouster. 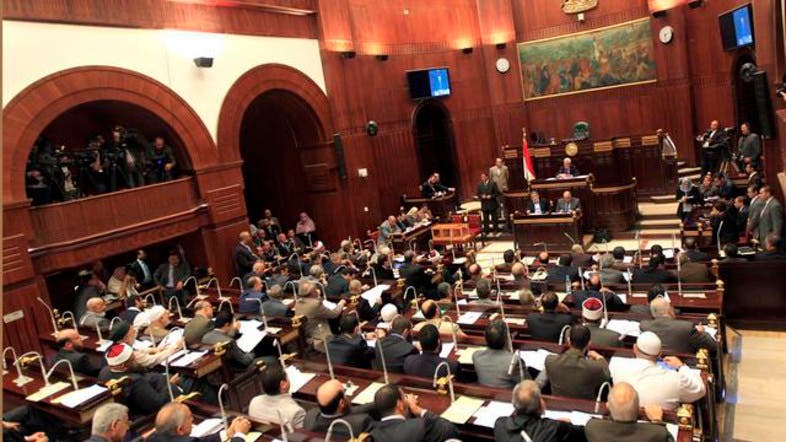 “Now we have approved the draft,” Amr Mussa, the head of the 50-member constitution-drafting panel, announced on live television. The revised charter preserves the military’s wide-ranging powers, including the ability to try civilians in certain cases. This has angered secular groups that backed the military in ousting Mursi. The constitution will be put to a popular referendum early next year in the first step in a “democratic transition” promised by authorities. This is set to be followed by presidential and parliamentary elections in mid-2014. On Saturday’s first day of voting the 50-member panel approved 138 of the 247 articles of the draft charter. Those articles included one stipulating that Islamic sharia law will be the main source of legislation, as was also the case during the regime of toppled ruler Hosni Mubarak. The other main article approved was one forbidding the formation of religious parties or parties based on religious grounds. On Sunday, articles 204 and 234 are set to be the focus. These concern the Egyptian military, which led the ouster of Islamist President Mohammad Mursi in July after millions of people called for his resignation after just one year in office. Article 204 says that “no civilian can be tried by military judges, except for crimes of direct attacks on armed forces, military installations and military personnel”. Secular artists have demonstrated against the provision, saying it could be applied to protesters, journalists and dissidents. Activists and rights groups say that the draft charter also fails to curb the powers and privileges of the military. Article 234 stipulates that the defense minister be appointed in agreement with the Supreme Council of the Armed Forces, although panel spokesman Mohammed Salmawy told AFP this clause will apply only for the first two presidential terms. The draft constitution also ensures that the military’s budget remains beyond civilian scrutiny. Media reaction on Sunday to the new constitution was generally positive. The interim authorities suspended the previous constitution written under Mursi’s presidency after his removal on July 3. That charter was drafted by a 100-member panel that was dominated by his Islamist allies. The current panel includes representatives from civil society, political parties, institutions such as the army and police, and the Coptic Church. It includes just two Islamists, neither of whom is from Mursi’s Muslim Brotherhood which won a series of polls after Mubarak’s ouster. The Brotherhood has been the target of a sweeping crackdown since Aug. 14 that has seen more than 1,000 people killed and thousands more arrested. RAMALLAH (Ma’an) — The Teacher’s Union announced late Sunday that it will go through with plans to have a strike on Monday despite the Palestinian Authority’s attempts to prevent them through legal means. Earlier in the day, Palestinian High Court of Justice ordered the Teachers’ Union to call off their strike temporarily until a final decision could be made regarding a Palestinian Authority complaint against the union made earlier in the day. “All we received are comments in the media, so Monday will be a full strike,” he added. The PA earlier in the day tried to prevent their plans for an open strike, which was announced on Friday, by filing a complaint at the High Court. The Court ordered the union to call off the strike until it had a chance to have a complete hearing. It postponed the hearing to Monday in order to give both parties sufficient time to provide the court with their cases. However, no union representatives were present at the meeting. The Teacher’s Union has held limited strikes over the last few weeks in protest over the Ministry of Education’s failure to fully implement an agreement reached last September. Amid a dire fuel and power shortage in the Gaza Strip, Amnesty International has called on the Israeli regime to immediately end the blockade it has imposed on the enclave. “Israel must immediately lift its blockade on the Gaza Strip, including by allowing the delivery of fuel and other essential supplies into the territory without restrictions,” Amnesty said in a statement issued on Sunday. The rights organization also warned of a prolonged humanitarian crisis in Gaza due to fuel shortage ahead of winter. Over 1.7 million people of Gaza are living without power since the territory’s sole power plant was forced to shut down last month due to fuel shortage, Amnesty said. “This latest harsh setback has exacerbated the assault on the dignity of Palestinians in Gaza and the massive denial of rights they have experienced for more than six years because of Israel’s blockade, together with restrictions imposed by Egypt,” said Philip Luther, the Middle East and North Africa director at Amnesty International. Israel imposed an all-out land, aerial, and naval blockade on Gaza in June 2007. The siege has had a disastrous impact on the humanitarian and economic situation in the impoverished enclave, having turned the territory into the world’s largest open-air prison. In recent months, fuel and electricity shortages in Gaza have worsened as the Egyptian military has blocked supply tunnels leading into the region. The underground tunnels serve as a lifeline for the Palestinians in Gaza. The blockaded silver is now experiencing daily power outages of up to 16 hours. Hospitals, homes, water and sanitation plants as well as businesses have also been affected by the serious energy shortage. The power cut has caused the failure of sewerage and water plants. It has also put the lives of many hospitalized patients in danger. According to the UN, all 291 water and wastewater facilities in the Gaza Strip are now relying on standby generators, which are also affected by the fuel shortages. De bezetting van Palestina door Israël is “het best gedocumenteerde conflict ter wereld”, zegt Inge Neefs in het laatste hoofdstuk van haar boek. ‘Gaza op mijn hoofd’ is dus zeker niet het laatste boek dat er over geschreven wordt. Neefs laat haar getuigen aan het woord zonder tussenbeide te komen, zonder te becommentariëren. Zo is er het verhaal van de visser die binnen de toegestane 3 zeemijl wordt opgepakt door de Israëlische marine, na urenlange ondervragingen wordt vrijgelaten zonder dat er ooit een officiële aanklacht volgt en bij thuiskomst mag vaststellen dat zijn boot – zijn enige broodwinning – in een Israëlische haven aan de ketting ligt. Zelden was een titel zo juist gekozen. Gaza zit in het hoofd van Inge Neefs. De verhalen, de getuigenissen, ze laten je niet los. Wanneer je denkt dat je het ergste wel hebt gelezen, blijkt één verhaal verder een nog gruwelijker aspect van de militaire blokkkade in je hoofd te kruipen. RAMALLAH, (PIC)– A Palestinian prisoner in his sixties has refrained from having his medication in Israeli captivity in protest at medical neglect pursued by the Israeli prisons services. The Palestine prisoners center for studies said in a press release on Saturday that Hussein Amr, 61, has been held in administrative detention since last June. It said that Amr suffers a number of diseases including diabetes, unstable blood pressure, rheumatism, gout, and others. The center said that Amr’s health condition is very difficult and the Israeli prison administration refuses to accord him proper treatment. It said that Amr refused to take insulin shots because of the Negev prison administration’s delay in treating him and its refusal to allow all needed medicines for his condition. Amr, from Al-Khalil, has been previously held in Israeli occupation jails for five years. Funeral of Khaled al-Najjar and Mussa Fanasheh on Wednesday in Yatta. Clashes erupted in Qalandia Thursday night and Friday morning after Mahmoud Wajeeh Awwad passed away in an Israeli hospital due to the bullet wounds he sustained at clashes eight months ago. According to the most recent statistics compiled by the United Nations Office for the Coordination of Humanitarian Affairs, 27 Palestinians were killed from January to October of this year, 15 of whom died since the start of the peace talks in late July. At least 8 more Palestinians have died throughout the month of November. Mahmoud Wajeeh Awwad had been in a coma over the past eight months, after having been shot by Israeli soldiers with a rubber-coated steel bullet during clashes at the entrance of Qalandia refugee camp, Ma’an News Agency reported. He was being treated in the Hadassah Ein Karem Hospital in Jerusalem, where he was pronounced dead by medics late Thursday evening, according to the Palestine News Network. He was in his twenties. The so-called Israeli “riot dispersal” techniques of firing rubber-coated steel bullets and tear gas canisters at Palestinian protesters have killed several protesters in the past. In September this year, Israel’s Military Advocate General closed the investigation into Bassem Abu Rahmeh’s death for instance, supposedly because of a lack of evidence according to+972 Magazine. Abu Rahmeh was killed in April 2009, when Israeli soldiers fired a tear gas canister directly at his chest during a protest in Bil’in. Human rights organizations B’Tselem and Yesh Din pointed out that video segments show that he was not acting violently or putting the soldiers in danger in any way at the time of his death. Bassem Abu Rahmeh’s sister, Jawaher, was killed in December 2011 during a similar protest in Bil’in after suffocating to death from tear gas fired by Israeli soldiers. Earlier on Thursday, 14-year old Nour Mohammad Afaneh died while she on the way to the hospital in an ambulance. Her father told Ma’an News Agency that she was in a critical condition due to complications stemming from severe pneumonia. The ambulance that was taking the girl to the Beit Jala Governmental Hospital was stopped at the Container Road checkpoint north of Bethlehem due to the closure of the checkpoint. The ambulance tried to reach the hospital through three alternative routes in heavy traffic before attempting to take Afaneh to the Ramallah Governmental Hospital instead. She passed away before arriving. Israeli forces have kept the checkpoint closed for the past three days, Popular Committee Spokesman Hani Halbiya toldMa’an News Agency. This worsens the already extremely heavy traffic situation in the area between Bethlehem and Ramallah. According to the PCHR report, the killings occurred in two separate incidents in and around Yatta. At around 6:00 PM, Israeli soldiers opened fire without warning on a white Subaru containing two men, Mousa Mohammed Makhamra and Mohammed Fo’ad Nairoukh, near an entrance to Route 60 east of Yatta. Both men were killed. The Israeli army claimed that the killings were part of an operation “aimed at a group that was planning attacks in Israel,” according to WAFA News Agency. An IDF spokesman said the men were members of a Salafist jihadi group that was planning attacks on both Israelis and the Palestinian Authority. In any case, the killing of Makhamra, Nairoukh, and al-Najjar amounted to “the death penalty without trial,” writesNasser Lahham, Chief Editor of Ma’an News Agency, in an editorial on the agency’s website. “The army makes itself the prosecutor, judge, and executioner,” said Dr. Mustafa Barghouti in an interview with the Palestine Monitor. “These extrajudicial killings are very dangerous and are creating a lot of anger with the people,” he said. During the current round of US-mediated peace negotiations, which began on July 29 of this year, the Israeli government has repeatedly accused the Palestinian Authority of sabotaging and undermining the talks. Yet, not only has Israel killed at least 23 Palestinians since then, it has also announced the expansion of its illegal settlements in the West Bank and East Jerusalem on several occasions. “Israel is using the peace negotiations as a cover for its settlement expansion and its general oppression of the Palestinian people,” Barghouti told the Palestine Monitor. On Monday, Israel announced the construction of 800 new settlement houses in the West Bank, two weeks after halting another plan to build 20,000 new homes. Ramallah – President Mahmoud Abbas heeft zondag in het presidentiële hoofdkwartier in Ramallah een gesprek gehad met de voorzitter van de Israëlische Arbeidspartij en leider van de Israëlische oppositie Yitzhak Herzog. Abbas lichtte aan zijn gast de soevereiniteit, de laatste ontwikkelingen in het politieke proces en de Palestijns – Israëlische onderhandelingen toe. Hij benadrukte de inzet van de Palestijnse kant in de onderhandelingen om te komen tot de vestiging van de Palestijnse staat dat gebaseerd is op de grenzen van 1967, met Jeruzalem als hoofdstad. Abbas gaf hierbij aan om hierbij het principe van een twee-staten-oplossing te hanteren. Op zijn beurt toonde de leider van de Israëlische Arbeiderspartij Herzog, zich bereid steun te geven om de onderhandelingen voort te laten gaan waarbij de Palestijnse wensen meegenomen worden en er een vrede wordt bereikt op basis van de twee-staten-oplossing. Tenslotte is Herzog van mening dat rechtstreekse ontmoetingen tussen Netanyahu en Abbas nuttig zijn om de standpunten uit te wisselen en zouden de kans verhogen op het bereiken van vrede. 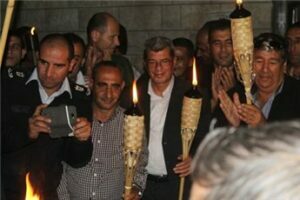 A solidarity evening with Palestinian political prisoner Mansour Mowqada was held in Salfit on November 29, calling for his release and that of his fellow sick prisoners. The mayor of Salfit, Said Shukour, said that the call of sick prisoners was an urgent humanitarian issue requiring international action. Mowqada uses a wheelchair, has tumors, and must use “plastic stomach” and colostomy bags for digestion and excretion. He receives mostly painkillers at Ramle prison clinic, which has been described as a “tomb for the living” for the 20 prisoners with the most severe health conditions. 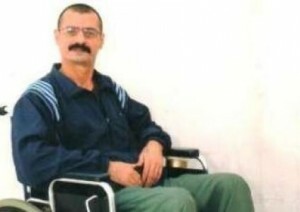 He lost the use of his legs when he was shot by Israeli occupation forces in 2002 and has spent the entire time since his arrest in the Ramle prison clinic. He is 42 years old and is serving a 30-year sentence. Nabil Natsheh, who has been held in administrative detention since March 27, 2013, has cancer of the lymph nodes. He was diagnosed in 2010 before his arrest and was receiving chemotherapy in Beit Jala. Natsheh has been suffering from high blood pressure and severe shoulder pain. Yousef Nadjeh suffers from epilepsy and memory problems. He has kidney problems, swelling in his legs and extremities and has lost balance due to head pain. He requires crutches to walk and fell in Ofer military court due to his ill health. Fuad Shoubaki is 84 years old. He was arrested in 2006 and is serving a 20 year sentence. He has an enlarged prostate and was recently admitted to Hadassah hospital for treatment. He needs eye surgery, which has a 95% success rate, but needs a private doctor to enter to complete the surgery. He is planning to petition the Supreme Court to be allowed a private doctor. Yahya Salameh has an enlarged tumor in his right shoulder and has not received surgery to remove it, despite numerous promises from the Ramon prison clinic. Imad Shoukeir has bullet fragments in his body from when he was shot in 2002 by Israeli forces and continues to suffer severe pain from the presence of the bullet fragments. Click here to take action to support sick Palestinian prisoners. 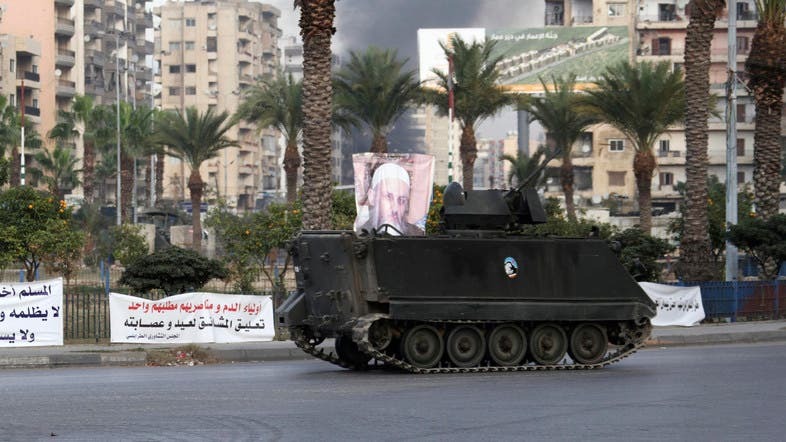 Smoke rises as a Lebanese Army armed vehicle drives through a street in Tripoli, northern Lebanon, Dec. 1, 2013. Lebanon’s state news agency says clashes between supporters of Syrian President Bashar Assad and opponents killed eight people in the northern city of Tripoli over the weekend. The NNA said Sunday that 60 people were wounded. Sectarian clashes linked to the war in neighboring Syria often flare between two impoverished rival neighborhoods in the rundown coastal city. The Bab Tabbaneh district is largely Sunni Muslim, as are most of the Syrian rebels fighting Assad’s rule. Residents of Jabal Mohsen are mostly of Assad’s Alawite sect. Tripoli is overwhelmingly Sunni Muslim but the fighting rarely spreads beyond the two neighborhoods. Fighting began Saturday after Sunni gunmen shot a man whose brother controls an Alawite militia, sparking gun battles that trapped children in schools and forced traders to flee their shops.